I live in Petukangan Utara, Jakarta Selatan, a district area bordered with Jakarta Barat in north side and Tangerang in west side. When i was a child, i was about 7 - 8 years old, about 28 years ago, i like played at creek with my friends, caught fish. The water is grey-brown indicate it that the water was not so dirty most contain mud and soil. Some kind of fish could still alive in it, such as Sepat (Trichogaster trichopterus), Julung-julung (Hemiramphus brasiliensis)and rice field Crab (Paranthelpusa Convexa) . At that time, trees and empty land is still wide including water absorption area and not so many houses built if comparing today, so that waste water from household still flowed well by creek with keeping it for fish life . The creek's condition quite well in general. At that time, with the condition is still natural, i and my friends could caught fish,went fishing, played football and other games in space area, played on trees and caught dragonflies where found a lot at that time, because trees are still a lot. 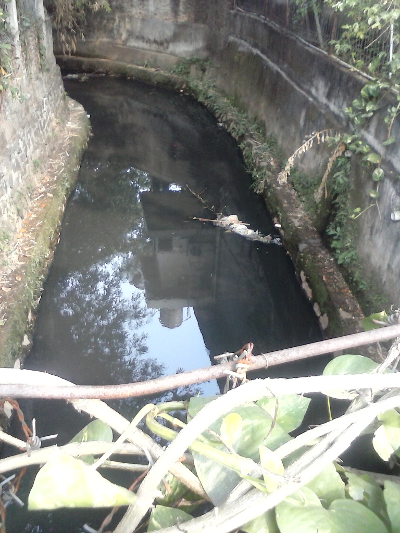 Today, the creek water is very dirty, it is black moreover when in dry season, indicate it that no fish can live there anymore. It caused by more people live here and need more houses so human have to cut trees and space area is decreased also throw waste water more than previous years . In the other hand the creek capacity is still same or maybe less because mud sediment is growing. And it causes the water is black, not a habitat anymore for fish. Some of surrounding area on the creek especially at the picture i took, is a campus area. Previously it is land owned by people, there are fish pools and garden but today a campus bought it and change fish pools become buildings, parking area,etc. So, what's people's loss because that change environment including creek water change from low dirty to very dirty ?. 1. Fish are gone. Means food supply is decreased. 2. Clear land water is depleted fastly. When dry season in 3 months, households start difficult to find it, digging land deeply is a must to find clear water. Clear water from water company has not come to this area. 3. Food supply from trees such as fruits and vegetables has decreased (Especially for land owner). So everything we need must buy. 4. Temperature is higher because trees are decreased. 5. Space area for children to play and human socializing is decreased too. Children have to play in street or rent a field to play futsal for example. What will we do to overcome that ? 1. Plant trees although in a small land or in plant's pot. 3. Create a wide green area per subdistrict / kecamatan . Actually it is a government task. 5. Keep clean our environment including creek and river. So, the importance to keep our environment green means make our life and our next generation life is sustainable and keep comfort because we are so dependent with our environment. Keeping our environment is keeping life itself. Image : By myself. My dirty creek .